Rent villas and apartments in Muntanya de la Sella, Spain with private pools. Book affordable holiday rentals that are near a golf course. This 4 bedroom villa with private pool is located in Muntanya de la Sella and sleeps 8 people. It has WiFi, air conditioning and barbeque facilities. The villa is near a beach. This 4 bedroom villa with private pool is located in Muntanya de la Sella and sleeps 8 people. It has WiFi, air conditioning and a garden. The villa is near a beach. This holiday home fulfils every wish. The main building includes two separate living quarters, connected through a perron. This 4 bedroom villa with private pool is located in Muntanya de la Sella and sleeps 6 people. It has WiFi, air conditioning and a garden. The villa is near a beach. In the quiet district of La Sella you will find this beautiful holiday home with communal pool. 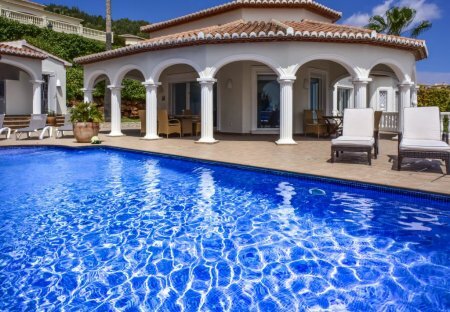 This 3-bedroom villa for up to 6 guests is located in Denia and has a private swimming pool. This holiday home with private pool in La Sella leaves nothing to be desired. From the winter garden and the terrace. Villa Ballencia is a fabulous, modern villa featuring stunning views of the mountains and the sea.